Yuksel Hotel is located gracefully at the heart of the historic peninsula and providing its guests the five star luxury in an opulent environment. This great hotel is chosen by the guests who travel from England, Germany, Spain, Italy, France, America and Russia. 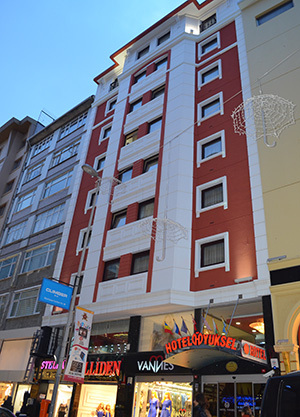 With its recently renovated 77 rooms, Yuksel Hotel is located in the heart of old city Istanbul. Free Wi-Fi and satellite channels are standard in Yuksel Hotel's modern rooms. The soundproof rooms have contemporary décor and offer views of the historic city. Precious guests of Yuksel Hotel can enjoy the delicious open buffet breakfast and 24 hour room service. The hotel is located in a vital spot that is in the walking distance from the major historic visit places such as the Grand Bazaar, Sultanahmet Mosque, Hagia Sophia Museum, Yerebatan Cistern and Topkapi Palace. Major shopping centers such as Taksim Square, Nişantaşı, Osmanbey and Şişli are only 5 km away and also 15 minustes by cable railway, while the Atatürk Airport and the CNR Exhibition Center are in 13 km distance. You can take a tour of Istanbul by cable railway with only 1 ticket.